Cholula is the home of Pirámide Tepanapa or Pirámide Tlachihualtepetl, the Great Pyramid of Cholula, the largest pyramid in the world. Its base is four times the size of Khufu's Great Pyramid on the Giza plateau outside Cairo, Egypt. Local myth says that the giant being Xelhua built it from adobe bricks. Cholula can be visited as a longer day trip out of Mexico City. Some buses from Mexico City's Terminal Oriente (TAPO) to Puebla pass through Cholula. The Estrella Roja lines runs up to three first-class buses an hour to Puebla. They take almost two hours. Just make sure that you're on one passing through Cholula. It should cost around M$40-50. You can see the route on the map below, the new express highway as a double brown line and the older highway as the solid brown line. You climb from elevations close to 8,000' in the outskirts of Mexico City to cross a pass a little above 11,000' That pass is through a range of volcanos aligned north to south, between Cerro Tlaloc to the north and a string of peaks including Iztaccihuatl and Popocatepetl to its south. Cerro Tlaloc, also known as El Mirador, is its later Spanish name. The Aztecs knew it by its Nahuatl name Tlalocatepetl, referencing its being a sacred mountain where the rain god Tlaloc was worshiped on its summit. Its peak is at 13,615' (4,151m). All these peaks' elevations are shown as slightly different values on the below aviation map. Some of that may be due to actual changes in elevation with volcanic action. Tlaloc is one of the oldest and widest spread cults in ancient Mexico. It predates the Aztecs, and probably was adopted from an earlier Mayan deity Chaac and maybe in turn from an earlier Olmec deity. The major peak immediately south of the pass is Iztaccihuatl, also spelled Ixtaccihuatl, the third highest mountain in Mexico at 17,160' (5,230m). Its broad summit structure has four peaks, overlapping volcanic cones, aligned roughly north to south. Popocatepetl, further south, is even higher and an active volcano. Popocatepetl is an active volcano, and the second highest peak in Mexico at 17,802' (5,426m). Its name comes from the simple Nahuatl wording for its obvious feature: popōca / tepētl or it smokes / mountain Its summit contains a steep walled crater 400 to 600 meters across. It is one of Mexico's most violent volcanos, with more than 15 major eruptions since the Spanish arrived in 1519. The current series of major eruptions began with one in 1947, followed by a release of ash and gas carried up to 25 kilometers on December 21, 1994. Then, in December 2000, it produced its largest eruption in 1,200 years. Both Iztaccihuatl and Popocatepetl have permanent snow and glaciers. Aztec mythology said that Iztaccihuatl was a princess, the daughter of the emperor, and Popocatepetl was one of his warriors. The emperor sent Popocatepetl to war after promising him that Iztaccihuatl would be his wife when he returned. The emperor was assuming that Popocatepetl would not survive the battle. Iztaccihuatl was told, falsely, that Popocatepetl had been killed in the battle, and she died of grief. However, Popcatepetl survived the battle and returned to find that his love had died. He buried her outside Tenochtitlan and kneeled by her grave. The gods then changed the two lovers into snow-covered mountains. Popocatepetl became an active volcano, raining fire on the earth in his rage over the death of Iztaccihuatl. 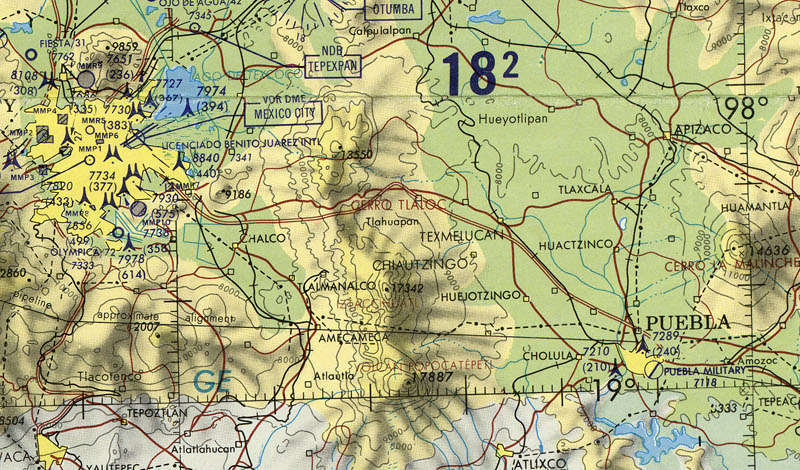 The highways pass between Cerro Tlaloc and Iztaccihuatl, descending below 8,000' to a broad flat basin on the way to Puebla. If you're on the correct bus, it with turn south at Texmelucan to pass through Huejotzingo before stopping at Cholula, whose name comes from the Nahuatl cholollan meaning place of refuge. The bus should let you out fairly close to the center of town. 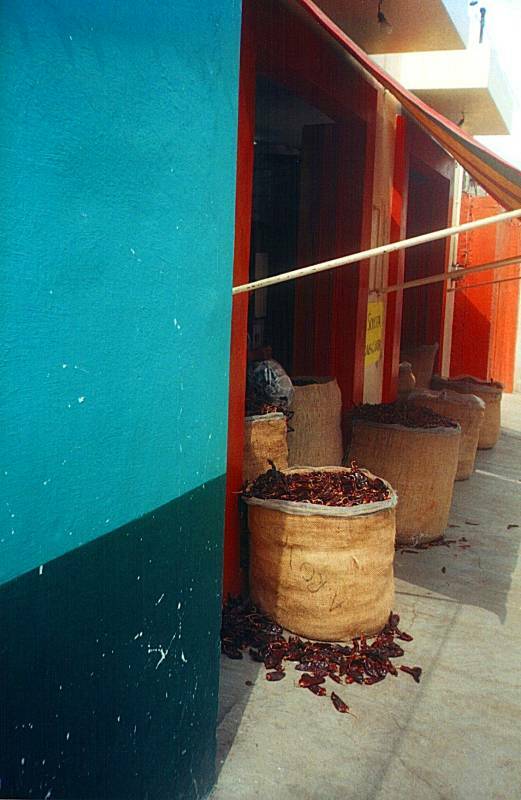 Estrella Roja runs an intercity bus station, and you will likely end up there. Get out and find your way to the pyramid. Pirámide Tepanapa, or Pirámide Tlachihualtepetl, the Great Pyramid of Cholula, is the largest pyramid in the world as measured by volume — 3,000,000 to 4,500,000 cubic meters. By the 4th century CE it was 65m high and 450m along each side of its base. That made its base four times the size of Khufu's Great Pyramid of Giza. Local myth said that it was built from adobe bricks by the giant named Xelhua after he escaped a flood in the nearby river valley. Tlachihualtepetl is Nahuatl for artificial mountain. It has traditionally been viewed as an enormous temple for the worship of Quetzalcoatl. See my other pages for the presumed birthplace of Queztalcoatl and the increase in the worship of Queztalcoatl at Teotihuacan. The area was first settled between 500 and 200 BCE as two small villages near springs. These people, speakers of Oto-Manguean languages, began building The pyramid and associated temple complex, seen beside the pyramid's base in this picture, in the 3rd century BCE. Construction continued through four distinct stages, with the pyramid and its associated temples reaching their final forms in the 9th century CE. Cholula had a population of about 100,000 people at its peak, the second largest population after Teotihuacan. The two cities seem to have been linked, with both declining in influence and population at the same time in the 7th and 8th centuries. Meanwhile, around 600 CE Cholula fell to the Olmeca-Xicallanca. Between 900 and 1300 CE, Toltecs and/or Chichimecs took over. In the 1100s, religious practice moved from the pyramid to a new temple built in what is now the center of Cholula. Later, the city fell to the Aztecs. The site came to be called Acholollan, Nahuatl for place of flight, leading to a theory that the original inhabitants had fled. By 1519 and the Spanish arrival, the pyramid was already overgrown. The city of Cholula was a major religious center, its temple to Quetzalcoatl was one of the most important pilgrimage destinations in the central highlands. The Spanish estimated that Cholula had 430 temples, about 20,000 homes in the city center, and another 20,000 homes on the city's periphery. It was a major business center, on several trade routes. 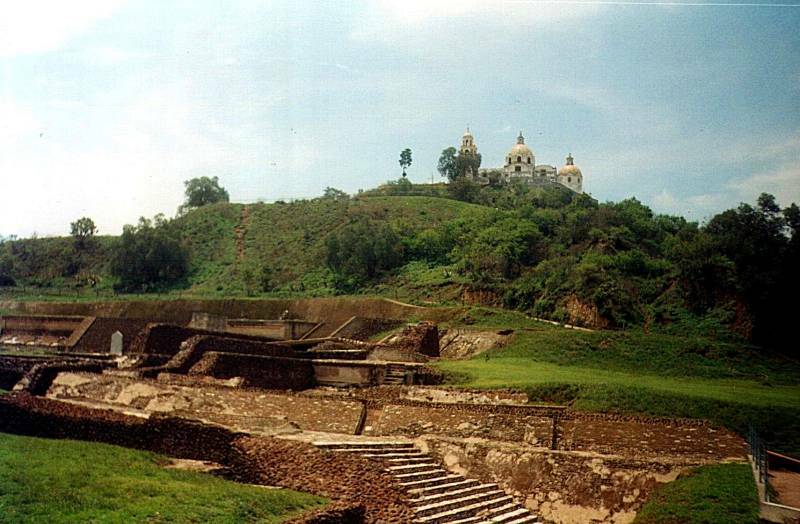 Now the Great Pyramid of Cholula looks like an isolated abrupt hill with a church at its peak. The Iglesia de Nuestra Señora de los Remedios or the Church of Our Lady of Remedies, also called the Santuario de la Virgen de los Remedios or the Sanctuary of the Virgin of Remedies, was built in 1594 by the Spanish. In standard Catholic church practice, this simply built on top of and took over an existing religious site. The Spanish arrived when the pyramid was dedicated to Goddess of the Nine Rains, known as Chiconauhquiauhitl. The same date for veneration of the goddess was maintained, September 8th, but the figure was replaced and a relatively tiny Spanish style structure was built on the peak. The big religious festivals are August 31st through September 8th, previously for Chiconauhquiauhitl and now for the Virgin of Remedies; the "Bajada" for two weeks in May and June, when the image of the Virgin of the Remedies is brought down from the pyramid and paraded through the neighborhoods, and the spring equinox with its Quetzalcoatl ritual. There are over eight kilometers of tunnels through the pyramid. With a ticket you can go through about 800 meters of it. Side tunnels are gated off. Tunnels lead both up and down at angles into the pyramid, extending as far as you can see. There are two famous murals to be seen as you pass through the tunnels. One is Chapulines with its images of grasshoppers surrounding the black skull. The other, more famous, is Bebedores or the Mural of the Drinkers, featuring a number of figures ritualistically drinking pulque and relaxing. The mural is about 57 meters long, one of the longest murals found from before the arrival of the Europeans. The six segments or "walls", muros, differ in content and technique, suggesting that they were done by six different artists. The Zona Arqueológica includes the Patio de los Altares, which was the main approach to the pyramid back in the day and, as it name indicates, an area of worship. Cholula's local specialty is cemitas. This is a sandwich on a big sesame bun rather than a tortilla. The bun is spread with a whole avocado, then stuffed with chicken grilled and shredded, stringy white cheese, onions, and green peppers. The center of Cholula's regular grid of streets is Plaza de la Concordia, sometimes called the Zócalo. The city hall is on one side of the plaza, built over the Xiuhcalli, the House of Turquoise, where the city's council of nobles met before the Spanish arrived. On another side of the plaza is the Monastery of San Gabriel, built in the 1500s soon after the Spanish arrival. An initial structure was erected in 1529, then the current complex of buildings was constructed starting in the 1540s. It still is home to about fifteen Franciscan monks. A third side of the plaza holds the Parish Church of San Pedro, built in the 1600s, and the fourth side has the Casa del Caballero Aguilar or the House of the Eagle Knight, originally one of the oldest residential structures in the area and now housing Museo de la Ciudad de Cholula, the city museum. 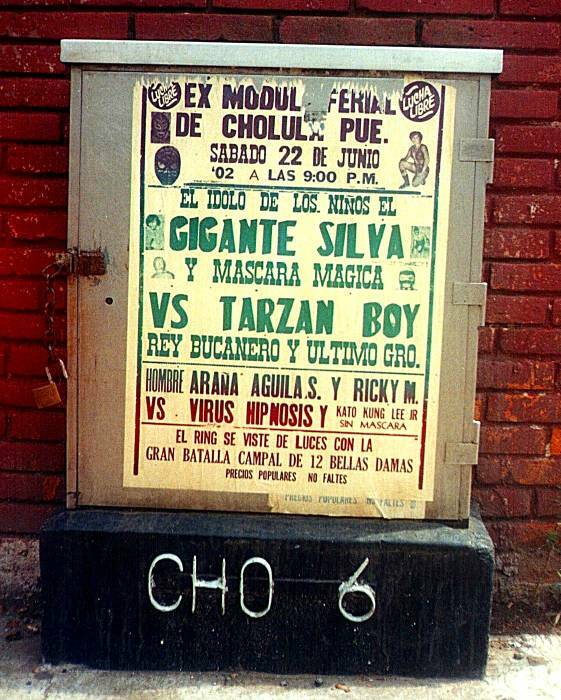 Cholula is a hotbed of lucha libre, masked wrestling! The city of Puebla is close to Cholula and also interesting, although I preferred Cholula. Collectivos (minibuses) run between Cholula and Puebla. They take about 20 minutes and are very cheap. 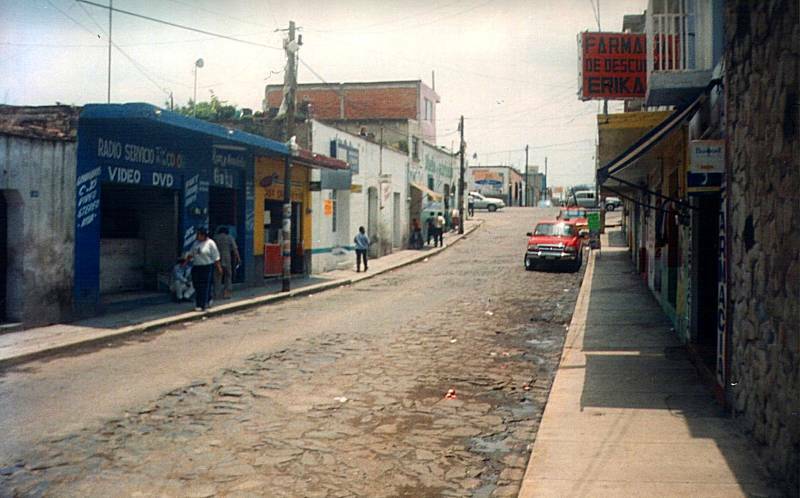 Puebla was founded by the Spanish in 1531, in an area known as Cuetlaxcoapan, meaning Where Serpents Change Their Skin. 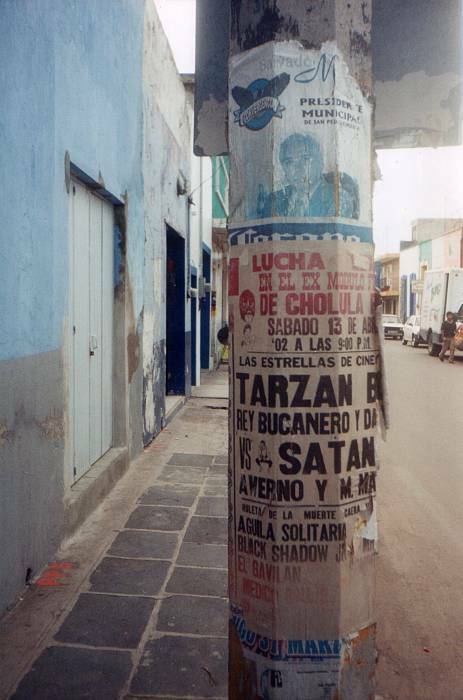 Puebla's rapid growth and an epidemic which killed many of the indigenous people claimed much of Cholula's prominence. In 1862, when France was intervening (or interfering) in Mexico, the Battle of Puebla occured. On 5 May 1862 the defending Mexican forces commanded by Ignacio Zaragora defeated what was then considered to be the most powerful army in the world, the French army under Count de Lorencez. Cinco de Mayo commemorates this Mexican victory. Mind you, the French came back in 1863 and captured the city, holding it until 1866, but it was still a great Mexican victory.